Okay, so it's time for the July edition of SRC. The last month has just whizzed by. Its been a huge whirlwind of activity. We've had to hunt and finalize another place to move into as our current lease is almost done. That, along with a full time job that sometimes feels more than a full time job has taken over the last month. I haven't had time to do much else. But I did do this assignment for today's reveal. And it was so very good. For this month's SRC assignment I had Karen's blog, Lavender and Lovage. If you haven't visited Karen's blog yet, you should, you really should. Karen is a freelance writer and recipe developer who toggles between Yorkshire and France. These influences on her food is evident. Her blog is gorgeous and she has one of the most delicious recipe lists I've come across. I literally wanted to make every second recipe I saw, if not every single one. I was torn between these perfect Scotch Eggs, these super comforting Beer Battered Fish and Chips and this gorgeous Dark Sticky Double Gingerbread. I still intend trying all of these but I needed something that was not too fussy, but was still delicious and comforting. So when I saw Karen's recipe for the Carrot, Cumin and Tomato Soup, I knew I had found a winner. I had the carrots and tomatoes on hand. All I had to do was pick up a little cream and croutons of some sort. I got some bagel crisps and they were beyond perfect. This soup is so easy to make and with just a few basic ingredients, its hard to believe how delicious and hearty it turned out. Thanks Karen, this is a soup I know I will make often. I stuck with the original recipe, except I halved it, since I was cooking for just the two of us .The only tiny change I made was I used fresh coriander leaves as a garnish instead of the parsley used in the original recipe. Heat the olive oil in a pan and add the garlic and onion and stir fry till the onions have softened and slightly browned. Add the cumin powder, tomatoes and carrot and saute for a minute. Cover the pot and let it all cook for about 5 minutes till the tomatoes get a little mushy and the cumin is nice and fragrant. Add the hot stock and stir well. Cover the pot and let it simmer for about 30 minutes or till the carrots are cooked through and are nice and tender. Let it cool a little and then carefully blitz the soup using an immersion blender or a regular blender. Serve up with some croutons and garnish with a drizzle of about a tablespoon of cream and fresh coriander leaves. Don't forget to check out what the other blogger's in Group A whipped up for today's reveal. I love Karen's blog! So many amazing choices! How did you ever decide? =) Your soup looks fabulous! It wasn't easy, I still want to try so many things! 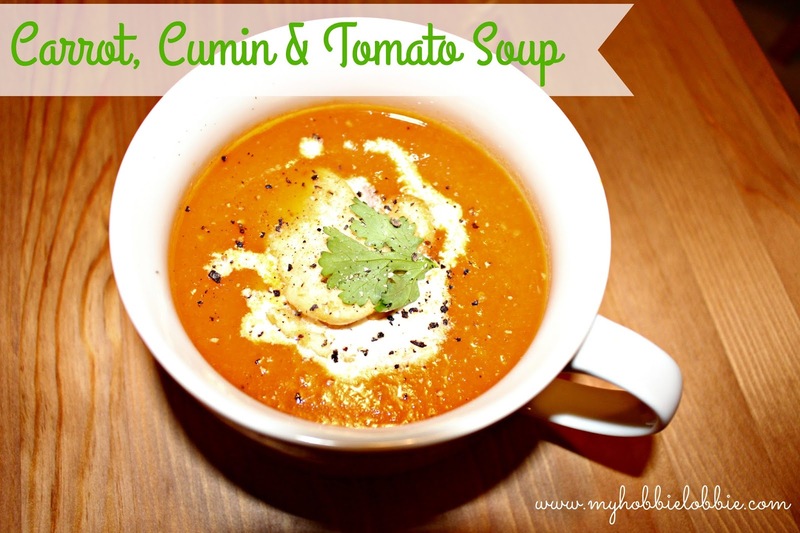 What a tasty sounding soup! I think this would be great this winter. It was ...we loved it .... Thanks for stopping by! What a yummy looking soup! I love soup and could eat it year round despite the temperature. And the added veggies are another plus! Happy Reveal Day! You bet Emily ... thanks for stopping by! Alright then, I found the soup I'm going to try to serve with the Parmesan Cake I made for SRC this month. My mouth was watering when I read the recipe and the pictures make it look so good. Great SRC choice. Oh, those incredible flavors. They go so well together. Absolutely GREAT SRC pick! Trisha, What a great soup you've cooked up. I love the combination of carrots and tomatoes - an unexpectedly complex set of flavors. Add the cumin and it's quite a tasty dish.